It’s all about love today. But truthfully, every day should be Valentine’s Day. those in our lives. Of course, every day cannot be all hearts and flowers. However, we can show our love for one another in so many ways. have received from a child who gathered some wildflowers for you on their way home. 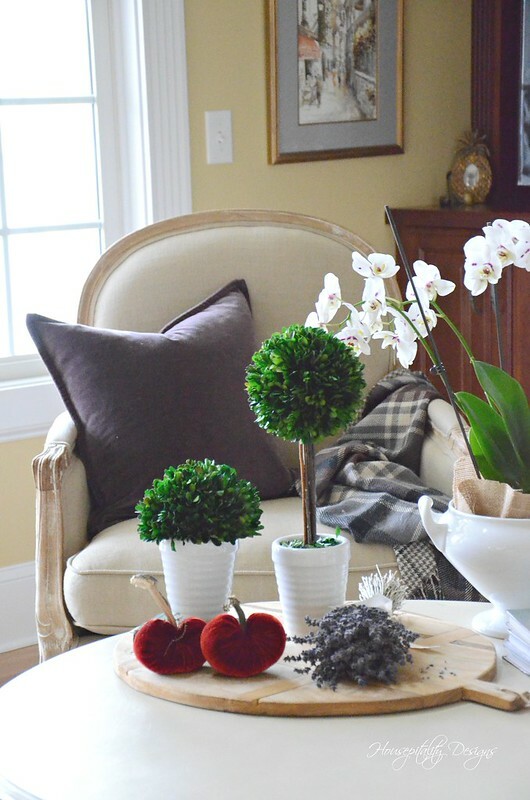 Today, this post does have hearts and flowers and some Plum Love – A Great Room Refresh. It was time to take the winter pillows away. Maybe it was because I have severe Spring Fever. as the temperature dropped almost 30 degrees the next day. 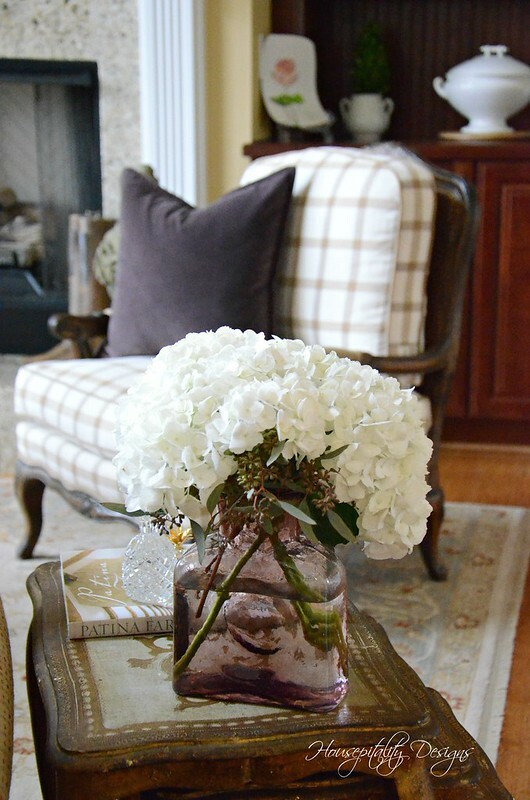 purple vase and filled it with white Hydrangeas and Seeded Eucalyptus. being used in so many interiors. So it was time for me to bring out the plum pillows . . . the ones I am “plum crazy” over! 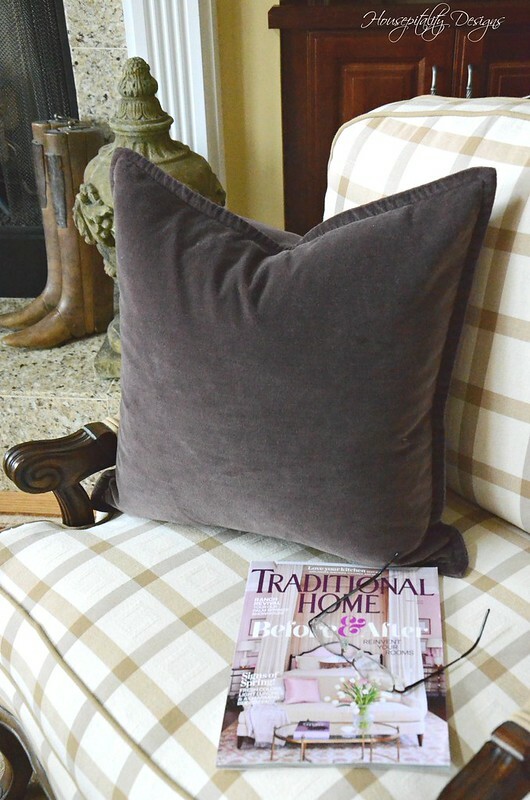 The plum pillow covers first appeared in the Sunroom dressed for Fall last year. 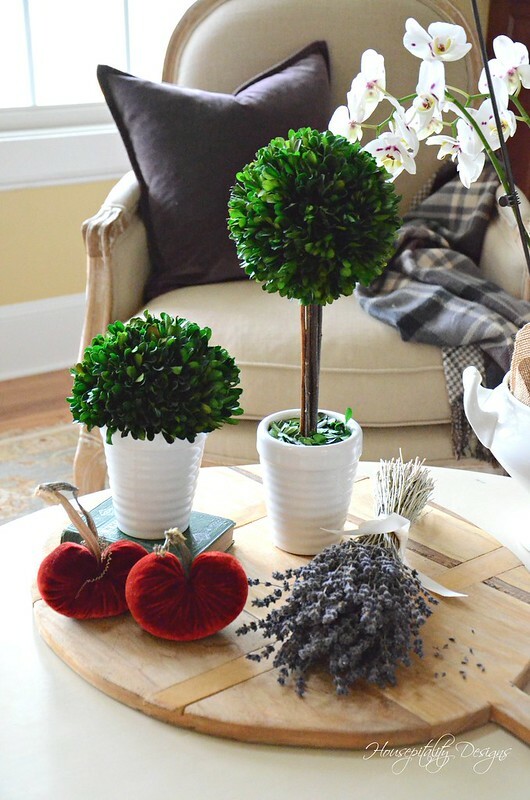 The vignette on the coffee table took on a new look too. An orchid with flecks of purple was placed in an ironstone tureen. 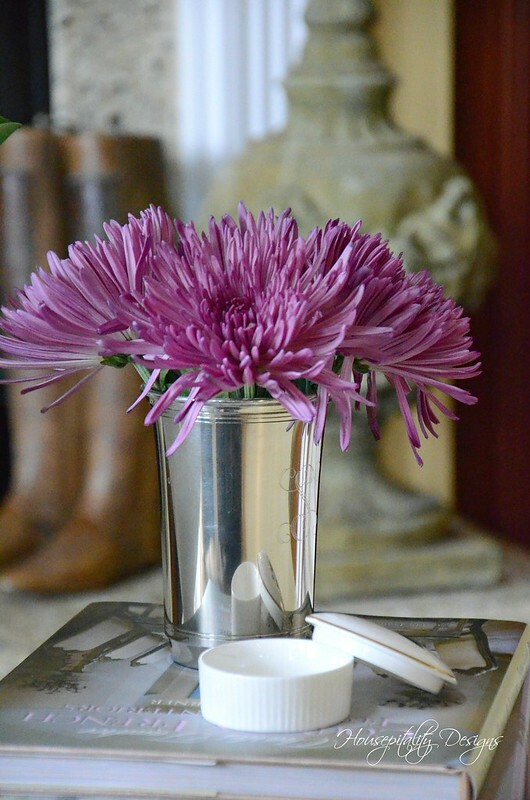 Purple Spider Mums from Trader Joe’s fill a monogrammed pewter cup. The red with the purple reminds me of the poem that was adopted by the Red Hat Society. “When I am old, I shall wear purple with a red hat that doesn’t go” . . .
and my “red hat” for the room. 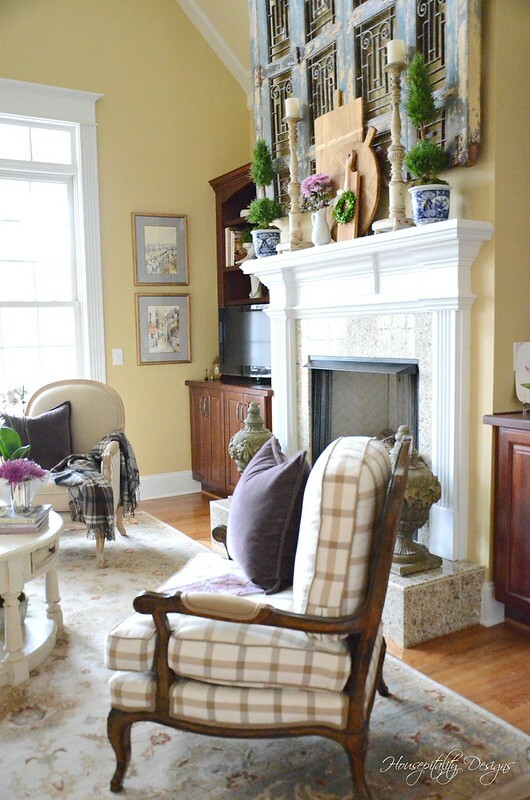 Another vignette with lavender sits on top of the antique French bamboo stool. 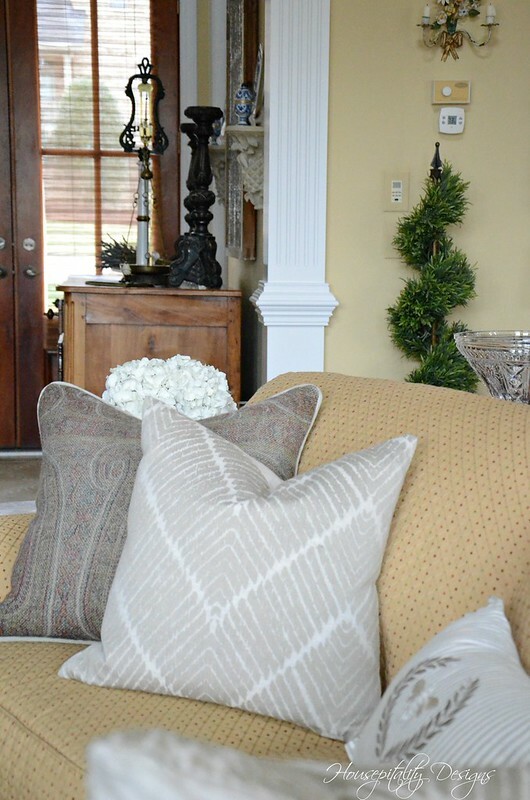 Pillows of shades of purple/plum and beige tones fill the sofa. The white pitcher on the mantel gets pretty mums too. 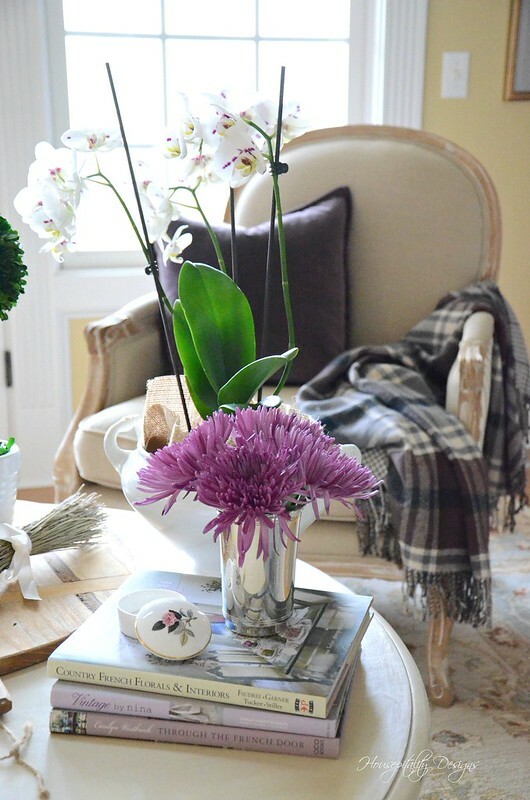 I must admit, I am truly loving the shades of plum and purple in this room. I love the beautiful shades of purple. So regal . . .
and who doesn’t love regal! I wish you all very Happy Valentine’s Day! May it be a most beautiful one! Lovely touches of plum and the little pops of red on this special day. Happy Valentine’s Day my friend! Happy Valentine’s Day Shirley. Unfortunately I am not loving the look on the mantel. Way too much going on for me. The candlesticks get lost in front of the huge piece hanging on the wall, and then when you take in the book shelves and all of the white pieces you have displayed… It is just too busy. Perhaps it is my ADD kicking in, but to me this display is dizzying. Happy Valentine’s Day Shirley! Love the plum. Sandra at Maison De Jardin’s recent post…Romance Is In The Air ! Love the plums, purples – it was my mother’s color and will always prompt thoughts of her. I spy a Blenko decanter! The shades of purple are beautiful in your room. I remember a few years back always seeing the Purple hat ladies having lunch at different restaurants. 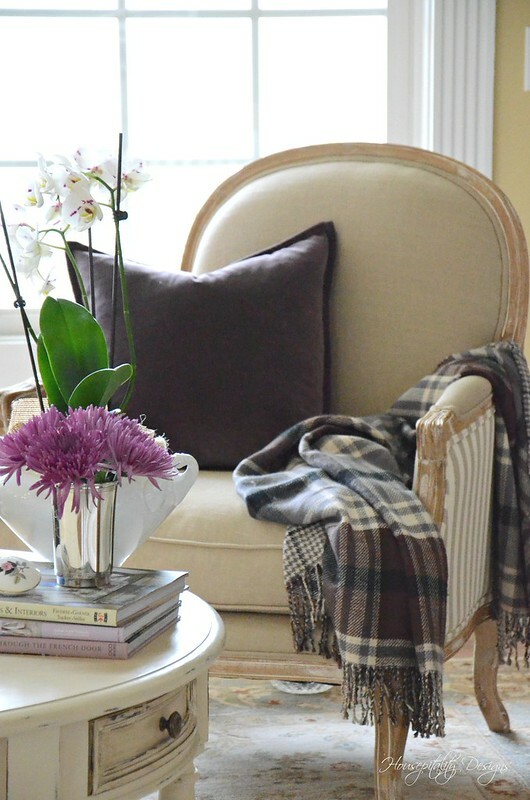 I love the pretty shades of plum in your great room! It is the perfect color for this time of year! Happy Valentine’s Day, Shirley!!!! Everything looks beautiful, Shirley! 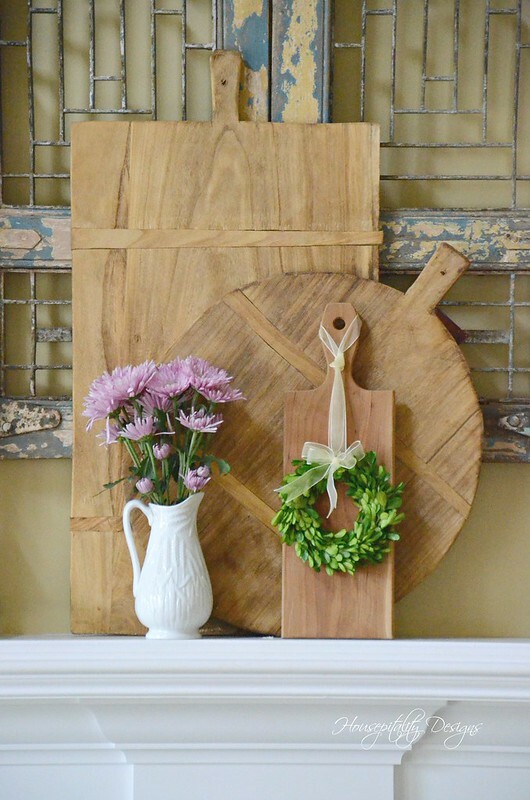 I love the plums, and your mantel display is wonderful. Happy Valentine’s Day, friend. I love you! Happy Valentine’s Day to you and Tom! 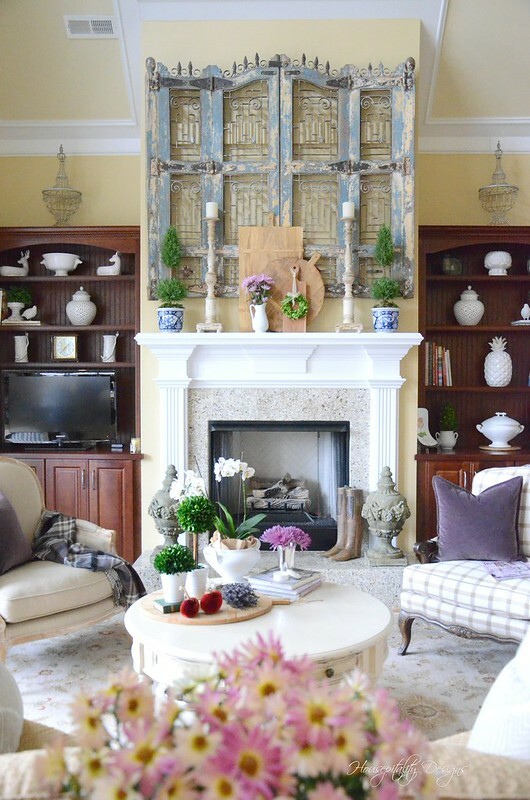 I love all the shades of purple that you have added to your great room. 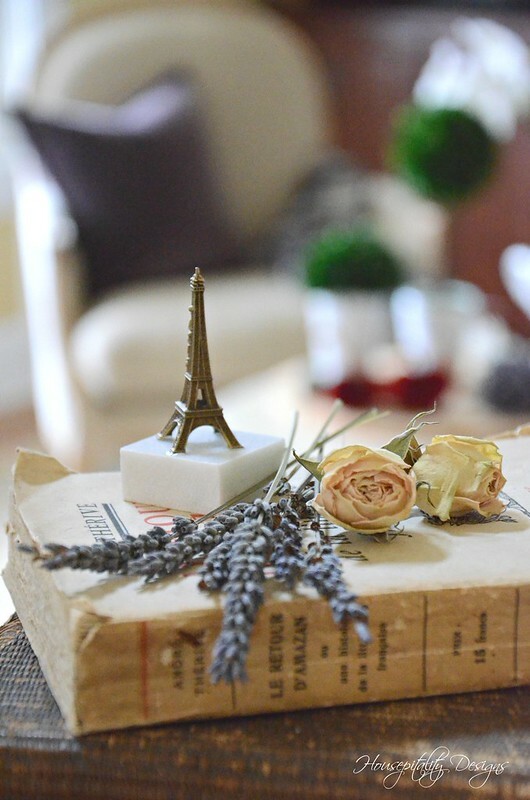 Everything looks fresh with a touch of romance…perfect for this time of year, I spy a pretty Eiffel Tower! Happy Valentine’s day, Shirley! I hope you have a special day! The plums look beautiful in the great room! I have Spring fever too and am antsy to get some touches of Spring spread around too! Have a beautiful day! Love the plum color and everything is just Beautiful! Roses are Red Violets are Blue but I sure Love Your Plum! HAPPY VALENTINE’S DAY! Shirley, beautiful touches! Growing up my bedroom was lavender and purple. It still holds a soft spot in my heart. Especially love it for spring! Your room looks lovely. I like how the touches of purple and plum work with the rest of the room. 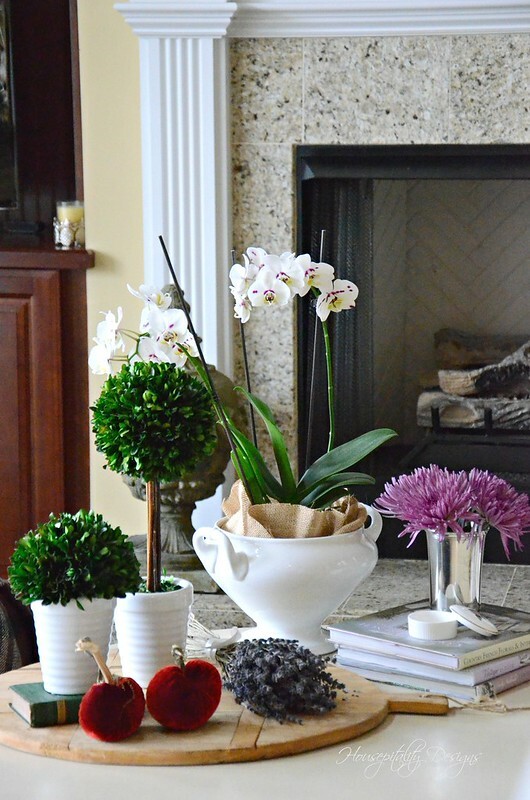 I especially like the plum vase with the hydrangeas. 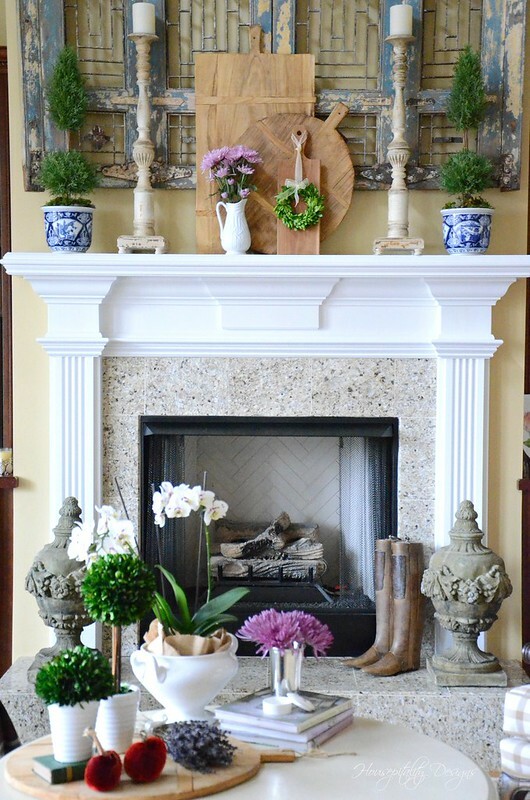 I also like Your mantel and the layering you did there. I hope you had a nice Valentine’s Day! Mother Nature is seemingly confused about the weather, and that makes me that much more confused about which decor works best right now. Lucky I’m still not able to do any decorating! I’m sure I’d be tearing my hair out!! 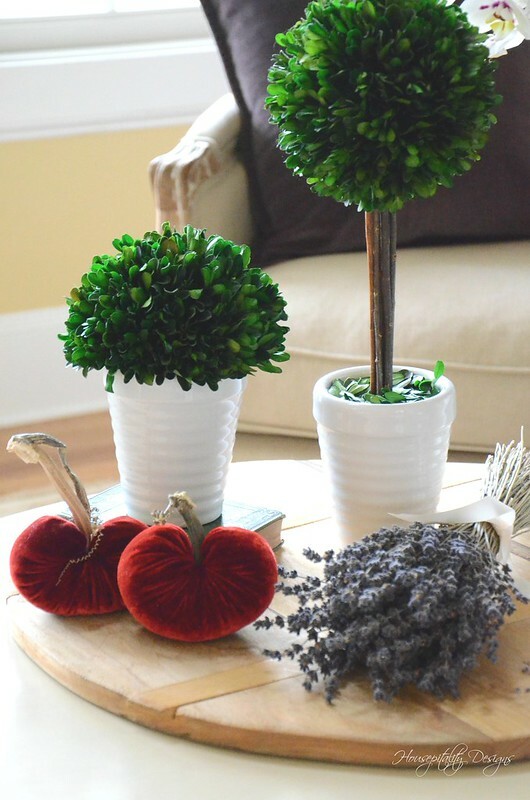 !🙃 You always know just the right touches to make your home look and feel fabulous! there is really a different vibe or aura whenever there is a plant or flower a room!I don’t know why, but it really calms a person…thank you so much for sharing this!